Legrand Legacy is the debut title of Semisoft, an indie studio based in Jakarta. For a title that’s been brewing since 2016, it’s already had its fair share of industry accolades in its short lifetime – these range from being a finalist at SXSW’s pitch competition to being showcased at PAX West and E3 in 2017. Billed as a return to golden era of JRPGs, the title has admittedly large shoes to fill of its own making. In this case, one might argue that drawing direct comparisons to games of yore is courting danger, and you’ll probably be right in that regard. 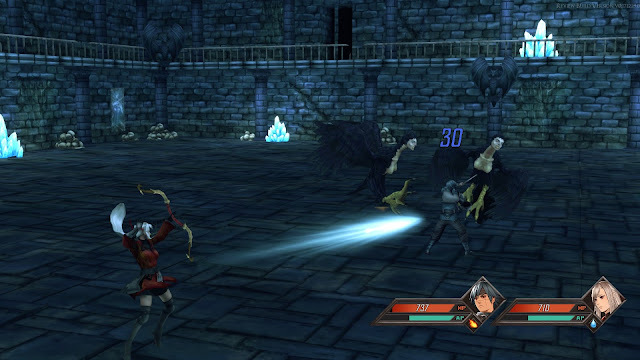 Legrand Legacy has an unfortunate issue with follow-through, but it deserves praise for bravely sticking to its guns despite a murky narrative and overwhelmingly clunky combat. Things get off to a rather dramatic start in the world of Legrand Legacy, and its opening cutscene captures an initial burst of excitement that gradually runs out of steam as you’re introduced to the trials and tribulations of the title’s characters. That’s not to say that the foundation for the game isn’t solid; in fact, it’s probably the opposite. You’ve got all the usual JRPG suspects here: an amnesiac hero who harbours a hidden power, a talented band of underdog accomplices tied together by fate, a skilled warrior with an icy exterior who happens to be a woman, and wizened paternal figures who harbour plenty of secrets. Oh, and there’s turn-based combat too. The game is a grab bag of common tropes that we’ve seen succeed time and time again so on paper, it looks great. In execution, it feels just as it’s been described: like someone strung together concepts that work without a thorough enough consideration of what ties all those elements together – a compelling story. 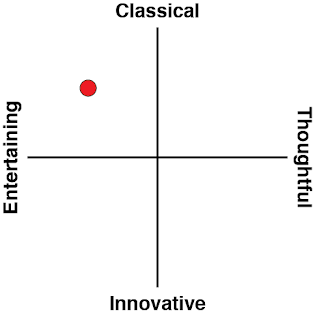 You’re thrust into the world of the game, Legrand, via a cutscene of intense gladiatorial combat. From there, you’re given all of ten minutes before your character’s circumstances change and you’re lifted out of abject slavery into a glorified bodyguard. Your new master reads minds, and thinks that you possess a power that you’ve never heard of in your meagre lifetime. If that description sounds rushed, that’s because it is; everything you initially learn about Legrand is in the form of dialogue from NPCs. If you weren’t particularly interested in taking world history lessons from a street urchin, this game will soon have you changing your tune. Talking to everyone is the only real way to get a clear picture of how the world has ended up in its current state, and if you want to know anything about the dynamics of the various cities that you’re in it, communicating with its inhabitants is a must. On its own, this is a nice sentiment; being incentivised to interact with the environment and with other characters is always a good thing in an game. However, where the issue lies is in the sheer amount of information that can pour out of the individuals that you interrogate on the street. Legrand Legacy does a lot of frontloading, especially about the horrific state of affairs that you’re finding yourself in early on. You play as Finn, a slave forced into the arena who slays a champion with the kind of hidden display of strength that lets mothers lift cars off babies. You black out after exercising this power, and then you’re taken on a ride across the land when an old man buys your time. From the word ‘go’, you’re bombarded by endless dialogue from others about how terrible the world is. Slavery is rife, people are horrifically unhappy, and there’s plenty of talk about how things used to be that hints at some kind of calamitous event caused by unknown forces. You learn a lot about the world at an extremely rapid pace, but once it’s established that everything has gone to hell in a handbasket, there’s not a lot left to engage with. There’s plenty of dialogue of the sort described above in Legrand Legacy, but it doesn’t flow particularly well. The characters themselves aren’t the issue; while they’re based off popular genre clichés, they don’t wear out their welcome by virtue of existing because their complexities and motivations maintain an aura of mystery for longer than you’d expect. Unfortunately, interactions between felt stilted and repetitive, even with the admirable sprucing up of character avatars during party dialogue in the vein of the Tales series. 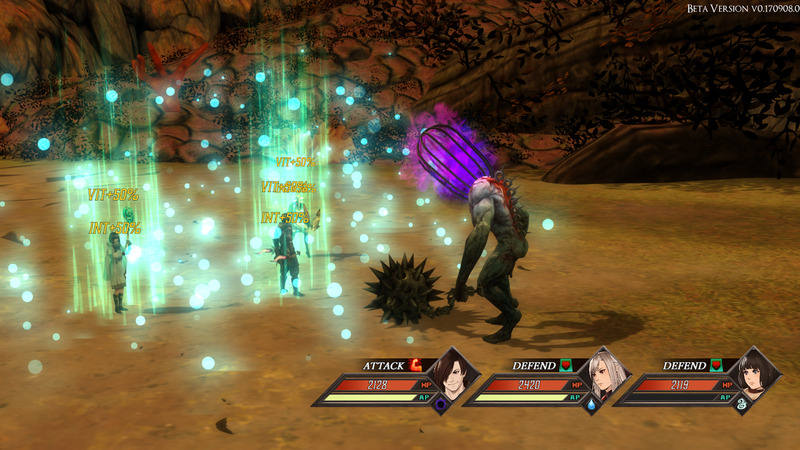 Another aspect of the game that excellently mimics its predecessors is the combat system. 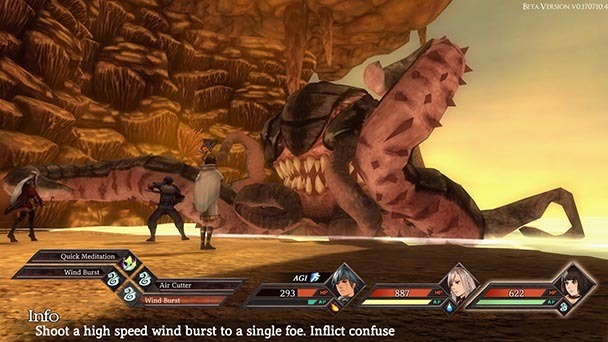 It’s not overly intricate, but its the usual turn-based affair that fans of JRPGs have long since become familiar with. Its singular point of difference is the use of an Action Circle mechanic i.e. you press a particular button when your characters are executing attacks or actions in combat, and your accuracy with that button press determines how successful that attack is. Testing it out both on a keyboard and with a controller didn’t make much of a difference: nailing a perfect timing on the Circle was tough. While the game initially tells you that mistiming an attack affects your damage, it doesn’t go into detail about the downward spiral that you can be locked into if you mess up your Action Circle timing. The mechanic works for blocking attacks as well, and you’ll be royally stuffed if you mess both that and your attack timing up because more often than not, an imperfect timing means a total miss. This is incredibly deadly even early on – the game has a chronic lack of checkpoints when you’re out and about getting beat up by all sorts of monsters, so you’re going to be incredibly on edge every time you waltz into combat. One aspect that confuses, however, is how you’re taught how to position characters. Stronger allies go up the front, ostensibly to protect spellcasters and the like who hide at the back of your group. However, enemies will often attack backline units even if you have a beefy tank up the front. While I can appreciate that positioning is often used as another layer in a combat system to increase complexity, it felt almost extraneous and the combat system overall could probably have done with a bit of a trim in order to feel enjoyable. It’s not all bad, though. There are also plenty of cool environmental factors that come into play when you’re adventuring (climates will affect your health and speed to varying degrees), but they can occasionally cross the line into frustrating territory when you’re having to deal with what feels like unfairly strong mobs at every turn. Dealing with hazards like unexpected quicksand and tightly-packed patrolling adds all add a nice layer of difficulty to the game, and it’s as much about managing yourself in battle and strategising out of it when it comes to success. 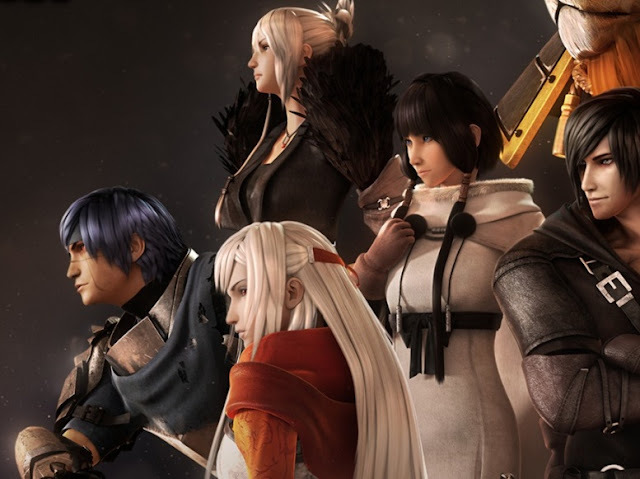 Legrand Legacy also benefits from the use of a stellar soundtrack which draws on the talents of the same person recruited for the brilliant score in NieR: Automata. From the painstakingly illustrated environments to the detail put into the animated appearances of main characters, there’s clearly been a lot of love put into the title despite its mechanical shortcomings. 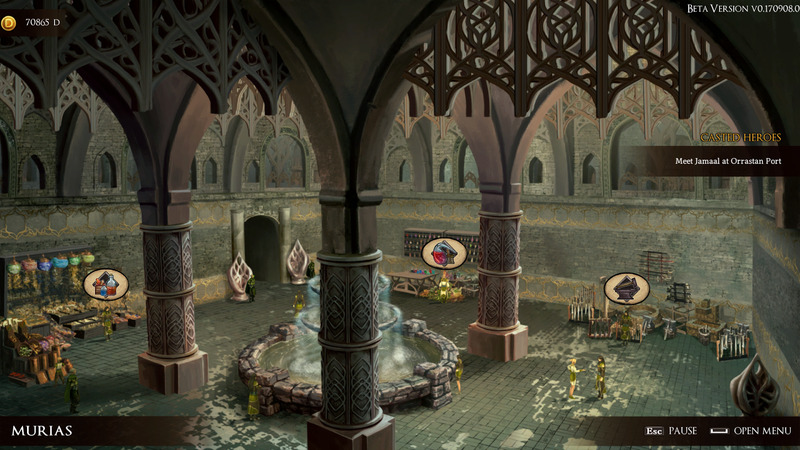 There are a variety of distinct ecosystems within the game – you go from a desert to a verdant environment to a city of pure wonder, and each brings its own unique challenges. For a small studio with what appears to have been a small budget, the art team has definitely tried to do its part in making a game that looks and sounds nostalgic. On that front at least, it’s a success. If you view Legrand Legacy strictly as a homage and not as a standalone title in itself with original merits, then adjusting your expectations accordingly is the key to being satisfied here. It’s got all the hallmarks of a successful JRPG, but dressing it up in beautiful hand-drawn maps and a stunning soundtrack hasn’t gone far enough in helping to conceal its flaws. It’s a shame, because the bones of a great game are there. 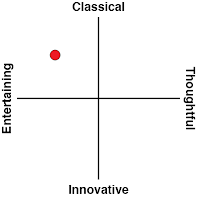 They’re just too bogged down in a shaky delivery to be enjoyed in the manner that they deserve.